MANILA, Philippines – The 'February 2017 Physical Therapist (PT) and Occupational Therapist (OT) Board Exams Results', together with the list of passers, top 10 examinees, top performing schools and related announcements are available at this website as PRC officially released the results online two (2) working days after the last day of board exam. As announced, 512 out of 856 passed the Physical Therapist Licensure Examination and 128 out of 185 passed the Occupational Therapist Licensure Examination. The licensure examinations are administered by PRC Board of Physical and Occupational Therapy headed by its chairman, Pollyana G. Escano and members, Raul G. Agustin, Bernadette M. Reyes, Delia R. Pabalan and Rolland Lyle D. Duque on February 5 & 6, 2017 at PRC testing centers in Manila, Baguio and Cebu. According to the Commission’s Resolution No. 2016-1019 series of 2016 entitled “Schedule of Licensure Examination for Year 2017”, the target release date for the results February 2017 PT-OT board exams will be on February 8, 2017 (Wednesday). However, results may be released earlier or later without prior notice. On the same exam conducted by PRC on August 2016, results are released online after three (3) working days while on February 2016, results are out after two (2) working days. The schedule of online appointment for issuance of Professional ID and Certificate of Registration will be from February 20-24, 2017. For Manila board passers, PRC is strictly implementing the online registration system for processing of appointment for registration effective March 30, 2016, details of which is written here. The two days Physical Therapist board exam covered topics from Basic Sciences (30%), Medical and Surgical Conditions, Pathology (25%) and Physical Therapy, Applications Electrotheraphy, Therapeutic Exercises, Principles of Rehabilitation and Hydrotherapy (45%). In Occupational Therapist board exam, here are the topics covered: Basic Sciences (20%), General Medical and Surgical Conditions (20%) and Occupational Therapy Applications Programs, Organization and Administration in Rehabilitation Psychosocial Dysfunction and Physical Disabilities (60%). On August 2016 board exam, 846 out of 1,243 passed the Physical Therapist while 114 out of 229 passed the occupational therapist. James Michael Manansala Hernandez from Angeles University - Foundation topped the PT exams garnering 90.25% rating while Marjorie Ceniza Apron from Velez College topped the OT list having 82.00% rating. Meanwhile, UST and Cebu Doctor's University are the respective schools that topped in the aforesaid board exams. 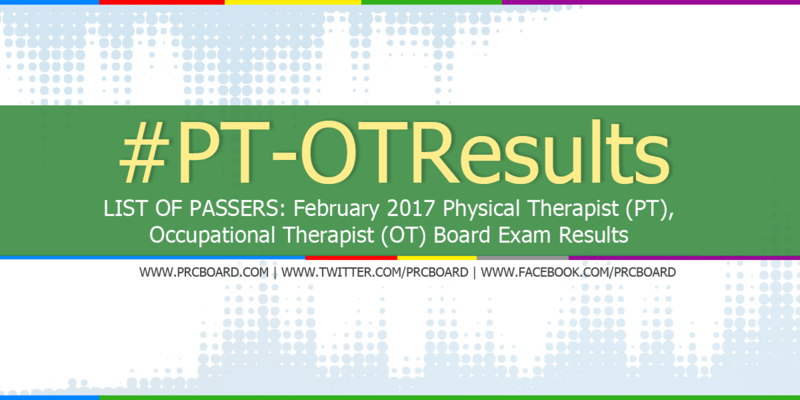 Full details here..
During February 2016 Physical Therapist and Occupational Therapist licensure exams, 521 out of 912 PT examinees passed while 55 out of 102 hurdled the OT. UP Diliman ranked first in the two board exams having all of its examinees passed. Anthony Palaran Acenas from Southwestern University topped the PT exams having 89.35% rating. He was followed by Amanda Marie Lim from Manila Adventiset College garnering 86.65%. In OT exams, Jay Allen Villon from UP Manila ranked first having 84.00% rating followed by Marinar Fe Latada from Davao Doctors College, Inc having 81.20%. To receive up-to-date news about February 2017 Physical Therapist and Occupational Therapist exam results, we advise our visitors to bookmark this page or follow us at our social media pages via Facebook and Twitter.